After roughly a year in the making, we are proud to announce the release of our Ultimate Steering Brace for your 84-01 Cherokee! - The design utilizes a large 1 1/4" grease-able pillow block bearing to brace the steering box from those hard hits and high loads that off-roading entails. The Ultimate Brace also effectively creates a truss between both Uni-Rails further stiffening the chassis. It is the constant pushing and pulling seen between the track bar and steering box that ultimately creates the all too common sheet metal cracks seen around the steering box and/or track bar mount. Combined with a good track bar brace, our steering brace not only effectively eliminates the stresses that leads to these cracks, but will also extend the life of the steering box by placing the sector shaft in double sheer. - We utilize a specially machined sector nut made from high strength 1144 alloy steel to give the sector shaft the support it needs. It then get's a silver zinc and blue chromate finish to help prevent corrosion. - In an effort to provide the highest quality parts, the Ultimate Brace undergoes a 3 stage powder coating process. It starts with a hot phosphate dip to clean and etch the steel. Then it gets a high zinc primer coat to help adhesion and prevent rust from forming. Finally, it's coated in a durable black hammer tone finish that is easy to clean and will look great for years to come. - We've incorporated high profile recovery and trailer tie down points into the design as well. The Brace does require the use of drop brackets if you plan to keep your factory sway bar. We offer our brackets at a discounted price if you purchase them with the Brace. 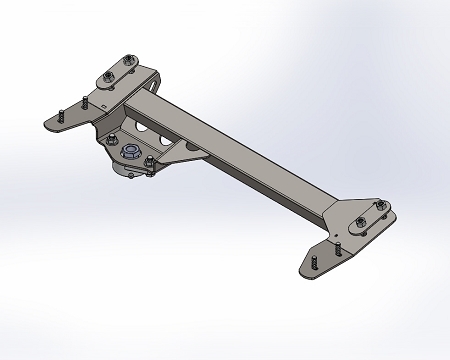 The brace has also been designed around the factory pitman arm, but most aftermarket drop arms will work. However, you'll need to make sure to check clearance at full steering lock to ensure the arm doesn't contact the brace. If it does, your steering stops will need to be adjusted. We now offer the kit in a DIY raw parts version! Simply select the kit from the drop down menu. (Requires fit-up and welding). Very sturdy and stiffens the frame and the gear box very well. I got the DIY kit cause i like to weld and its cheaper, everything was very self explanatory on how it went together. Thick metal very good quality. If you do not have a welder or know someone who does, i would get the regular kit. First off I was impressed how beefy this thing was compared to the photos. I got the DIY kit due to the extensive amount of modifications to my front end and found this to be a fun welding project. I only had to make one modification which was to cut off the tie down points due to interference with my custom bumper. Performance wise this thing really changed the feeling of my steering. I cant ever remember the XJ feeling so solid in the front end. No more weird noises or the worry of ripping my steering box from the frame. Excellent product and design. Well worth the money. I purchased this brace in order to shore up my steering box and stop a "popping" noise that was being produced by said movement. It took me and a friend about an hour to install after finding the correct sockets, and grinding down the crossmember. Not only did it stop the play in the steering box, but the whole front end feels tank-solid now. I can't recommend this product enough and am so glad I took my friends advise and bought this brace instead of a cheaper knock-off. You really do get what you paid for here, plus more! I was a tad skeptical when I ordered. I wasn't sure this would fix my steering, or lack there of. I'm blown away. I installed on a 98 xj along with a new steering box and even though I severely need balljoints it will hold my rig down the road at 70 no issues! It's on 33x12.5 MT's for reference. I will definitely be recommending this. I purchased this brace to strengthen my front end of the unibody, i bought the diy kit because my jeep had been wrecked slightly in the left front. this product is wonderful and after installing it i could drive my jeep one handed at 70 mph with bias ply super swampers, i would highly recommend this steering box brace. great product Boostwerks Engineering. Q: What comes in the raw kit, does it come with the hardware the bearing and does it need to be welded? There's not a whole lot of info but I love the design and thought that went into this product. The DIY kit comes with everything in the complete kit. The brace itself is simply raw and unwelded however. This allows you to modify the parts (if needed) as well as saving you some coin by doing the welding yourself. If your XJ has had substantial cracking or damage in or around the steering box area, I would recommend the DIY kit to ensure a good fit. Q: Does this steering utilize the stock holes or do new holes need to be drilled? Looks like the sway bar is eliminated. I just installed a 3" lift and I am trying to tighten up the front end of the jeep. This looks like an option but I would like to utilize the sway bar. A: The brace does utilize the existing sway bar holes. To use the brace with the factory sway bar you'll need our sway bar drop brackets in order for it to clear the bearing. Q: Im about to buy the ultimate steering brace assembled. I currently have a ORS integrated solenoid style stubby winch bumper. I'm wondering how far forward the crossmember hangs down from the frame and how far forward it sits compared to where the factory front crossmember is because mine is cut out for the winch to mount behind the bumper? I don't want to buy the finished product if I have to notch it to fit. I'll just get the diy one in that case. I can send pictures if that helps. I apologize about the late reply, but a picture of the underside would definitely help. The brace doesn't protrude past the front face of the cross-member, but the lower portion of the member does need to be trimmed to fit the brace.